Northwestern Court Reporters offer a comprehensive range of deposition services designed to prepare your case in an accurate, efficient way. If you’re looking for superb deposition services in the Twin Cities area and in Wisconsin, choose a firm with more than 40 years of experience and an enviable reputation for accuracy, timelines and exceptional customer service. NWCR features conference rooms in Eau Claire, Minneapolis, Hudson, Oakdale, St. Louis Park and Edina. Meet with your clients at our locations, any time, free of charge. Over 40 years in the business and a strategic partnership with DepoSpan has helped us build a network that can cover any job, anywhere in the country…complete with national repository. 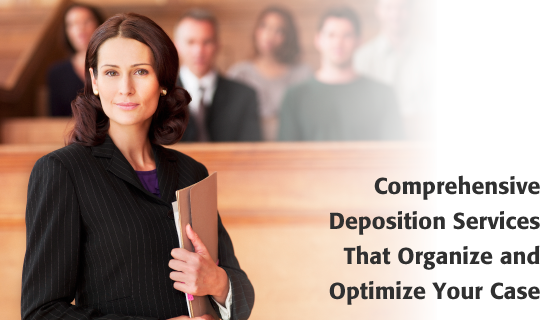 For more information on our superb DEPOSITION services, email us or contact us at (800) 628-7551.